Perusing the photo-pandemic known as Instagram, my heart rate kicked up and my finger slid to an abrupt stop on an unlikely image. It wasn’t the latest innovation in arms – I was getting my first look at the Hold Ur Fire Kit – a slick system for organizing, storing, and transporting your smaller arms and accoutrements! Maybe it’s just me and my possibly undiagnosed OCD, but keeping my firearms organized, dry, and easily accessible / deployable is a priority – especially for the EDC kits I use weekly. It is true, there are many pistol storage systems out there but the simplicity, apparent ease of use, variety of mounting options and availability of extra components drew me to try this USA-made system. Also pictured above are the Magazine Cuff and Mini-magazine Cuff (available soon). The Hold Ur Fire docking station is molded black ABS polymer featuring five vertical slots with stopping bumpers at the rear. It’s not some cheap, thin and flimsy base; it has some decent weight to it to help keep it in place and is quite sturdy with clean and smooth edges. The four provided black rubber feet are of great quality with 3M® adhesive backing. The foot housings are well-recessed, which helps greatly extend the life of the feet. Or, if so inclined, you could technically drive a screw through the holes in each corner of the docking station and secure it to a shelf, floor, drawer, or other surface. The five black ABS polymer panels that come with the Hold Ur Fire kit are 1/4-inch thick and measure 9.5″ x 11.5″. They are very rigid, even with the eight strap and accessory slots, four corner holes, and generous 4/5″ x 1 1.8″ oval handle hole. The molded arrow above the handle indicates the proper orientation of the panel. With all five panels inserted into the base, there are 1 7/8-inches of room between each panel. If needed for larger pistols and items, forgo a neighboring panel to double the leg room. Or move panels with larger items to the outside slot. Without any items, the assembled system measures 11″ W x 12″ D x 10.5″ H.
To attach firearms, magazines, and other items, feed the provided hook and loop cinch straps strategically through the panel – or take advantage of one of Hold Ur Fire’s mounting accessories. The Magazine Cuff features a rigid backer with padding and slips through a panel and secures on the back side with a hook and loop closure. The eight elastic loops are designed to hold four to eight short or long single and/or double-stack magazines, or any other smaller items that may find their way into your kit. While the Magazine Cuff is well-made, functions just as intended, and is an extremely useful accessory, some of the materials used – in particular the layer of padding behind the elastic loops – give moisture more places to gather than I’d like. Hold Ur Fire’s soon-to-be-released Mini-magazine Cuff is also a must-have accessory when using the system. But I’m baffled as to why they chose a cotton material for the strap – it will only absorb and retain moisture. Given they provided a pre-release version, I’m hoping their final version has nylon straps. As someone who overtly enjoys organizing, the Hold Ur Fire system was one of the most fun products I’ve tested so far this year. I had an absolute (but not literal) blast creating specific panels for the items I routinely put to use. And I was pleasantly surprised by what I could easily fit onto just one side of a single panel! Large frame EDC w/ light panel: SIG Sauer P226R EE, Streamlight TLR-1 HD, and two fifteen-round magazines. Small frame EDC w/ holsters panel: SIG Sauer P238 in Ultimate Holsters Cloud Tuck Hybrid holster and two seven-round magazines, one in an Ultimate Holsters Single Clip Mag Carrier. Suppressed conversion kit panel: SIG Sauer P226 .22 LR conversion kit, Dead Air Mask HD silencer, two ten-round SIG .22 LR magazines. Backwoods carry panel: Glock 20C and two fifteen-round magazines, one in G-code magazine holster. Suppressed Kalashnikov panel: Dead Air PBS-1 Wolverine silencer, two Kalashnikov variant thread pitch adapters, PBS-1 tool, one thirty-round 7.62×39 magazine. Yeah, I know what you’re thinking. That’s a ton of stuff!…it can’t possibly card in and out of the docking station, right? But it does. And does so extraordinarily well! In the configuration above each board can easily be removed without snagging on its neighbors. As previously mentioned, the system also works really well for related items, like the non-pew parts of an EDC kit. Or for those pistols that simply don’t see range time anymore but aren’t worth parting with. Yup, that’s a bulb light on an xD sub-compact! Thank goodness LEDs are standard place nowadays. And, as seen in the photo above (supplied by Hold Ur Fire), you can most certainly strap two pistols to a panel. In many cases you can even strap the pistol‘s accompanying magazines to the other side of the panel. However, I’m wholly unwilling to store any weapon with the muzzle pointed at me so that particular orientation isn’t on my list of options. Thankfully you can just flip the orientation of most pistols ninety degrees so they face up and down. Of course, some pistols are just too large to fit within the confines of the board. One of the things I enjoy about Hold Ur Fire’s design is that it doesn’t box you in (literally). If you have the clearance around the system, there’s no reason why a pistol can’t protrude a little. If you have a securing ring inside your safe, book case, or drawer, a simple 1/4″ cable lock can add an additional, albeit fairly useless if not rigged correctly, layer of security to your bundled items. Simply feed the cable through the holes located in the corners of the panels. Those holes also double as hangars for anyone who wishes to mount the panels directly to a wall or other vertical surface. Throughout the course of a month I put Hold Ur Fire’s system to the test, trying any configuration I could think of and often putting outfitted panels straight into my range bag. And while the docking station, panels, and magazine cuffs stood strong, I broke two of the hook and loop straps without much force. In each case the heat seal simply didn’t hold and gave up the plastic buckle. Not a deal-breaker by any means, but it would be great to see higher-quality stitched straps available in the future. Hold Ur Fire’s Complete Kit storage and transportation system, accompanied by the Magazine Cuff and Mini-Magazine Cuff, makes storing pistols, magazines, suppressor systems, EDC kits, and any other small-to-medium sized items a breeze. The system is sturdy and well-designed to allow for seemingly limitless configurations of firearms and accessories on a panel. But there are some areas where the product could be improved. Without question, the moisture-absorbing materials used in the magazine cuffs are a concern that could be easily addressed. It would be great to see additional magazine cuffs with just two or four elastic bands. And redesigning the panels to be symmetrical would allow users to mount two bases facing each other on vertical surfaces, creating horizontal shelves that slide in and out. Critiques aside, the Hold Ur Fire system is certainly one I won’t be giving up; in fact, I can’t wait to employ several more of these kits for weekly use and long-term storage. Shooting schools that provide pistols to their students will find the system very advantageous and even FFLs might get good use out of them. And for the average guy or gal who likes to be organized, clean, and ready to deploy their tools at a moment’s notice – even if just for some weekly range time – Hold Ur Fire is a simple and efficient choice! Simple, easy to use, and highly flexible, the Hold Ur Fire system is well-designed for everyday use. The system is “open”, allowing larger items to protrude from the top and sides of the panels and docking station. Configuring the panels is extremely intuitive and can be quite fun. Hold Ur Fire didn’t skimp on the thickness of the ABS polymer docking station and panels; they will hold-up to tough conditions, heavy pistols, and loaded magazines. However, the hook and loop straps that come with the kit are somewhat weak due to their heat-sealed manufacturing process. The system’s flexibility in regard to mounting orientations, as well as hook and loop closure and elastic strap types, and options for mounting the docking station come together to create a system that will secure your items very well for storage and transportation. The Hold Ur Fire system has a simple design, yet is built tough and offers nearly limitless flexibility in terms of items and their orientation. The system also does not box you into a completely confined space – it allows for items to stick above and out from its base. Unfortunately, I have to take a half-star off for the weak hook and loop straps. The Magazine Cuff is a nice reprieve from the standard hook and loop straps. Storing full or empty pistol magazines of all sizes, or any slender small and medium-sized items, is quick and easy. However, it takes up an entire board, only orients in one direction, and there’s no good way to cut it down. The reinforced and padded backer is nice, but draws concerns of water retention. Price as reviewed: MSRP TBD – PRODUCT AVAILABLE SOON! The Mini-Magazine Cuff is a nice accessory for the Hold Ur Fire system. It can easily be mounted to the storage board in a multitude of ways and retains the majority of pistol and rimfire magazines very well, as well as slender silencers and many other “pocket sized” items. A significant deduction was given for the use of moisture-absorbing materials used in its construction. I will admit that this tugs at my own OCD, but really, this is too much. If all you have is a computer systems engineer the all you see are cards and slots. Have you seen their new bigger trucks on Freightliner M2-106 chassis? Talk about a toy shop. An S-100 bus handgun storage rack – Brilliant! The weight of that massive transformer for the +5 VDC power supply will help disguise what’s inside. I thought exactly the same thing. Only us old folks get the references. I owned an Altair back in the day when computers were fun. I’m feeling the need to break out my KIM-1 and whip out a few bytes of machine code! Good review, and seems like a good product (if you’re into that sort of thing), but I immediately discounted its value to due to the name. Something about “ur” in virtually any context (save that of discussions of ancient Mesopotamia) grates on my nerves. Probably just another sign of impending old age and cane-shaking. This solution rated 3 canes shakes on the Nigel scale. Storage is good…access is somewhat limited, though. This is all I need, more stuff. More stuff to organize your existing stuff doesn’t count against your overall stuff total. I see you, too, have an ugly co-pay on your health insurance. Meh. Kind of clever. Seriously though: who here has only 2 mags for their autopistols? I can see storage, but without a case or handle, how exactly is this supposed to be transportation? The thought behind it is to pull the panel(s) out of the docking station to transport. 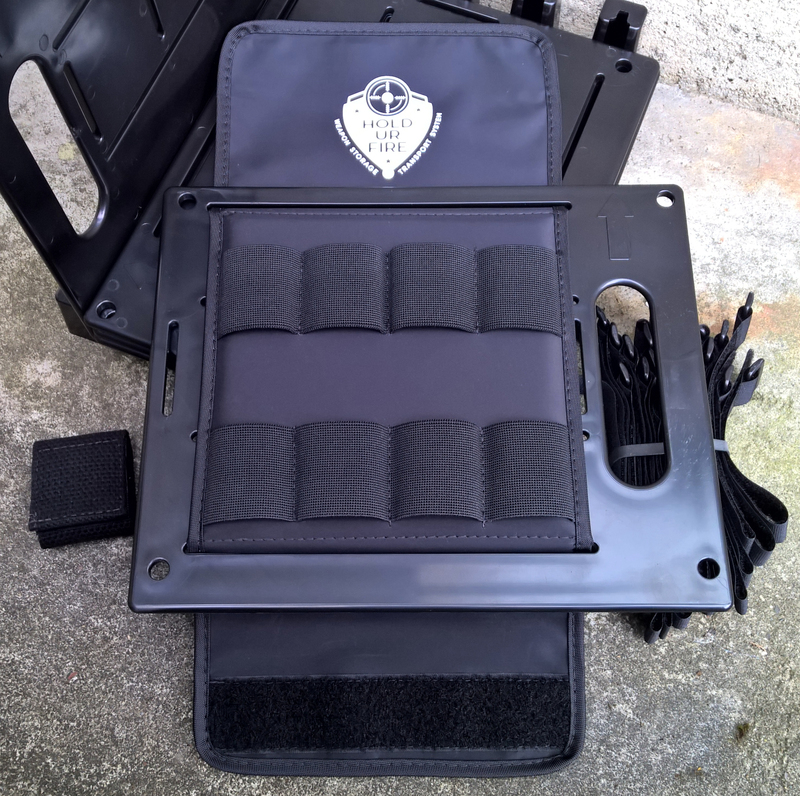 Each panel would come out of the docking station and into your range bag, soft case, or hard case. There is an assumption that most people won’t need all five panels worth of gear at once. However, I’m sure there is a bag out there that would fit the entire system. Yep, it’s mostly just you, as you said.